This MODBUS USB converter does not need configuration. In case your computer fails to load the driver, you can upload the DRIVER manually. 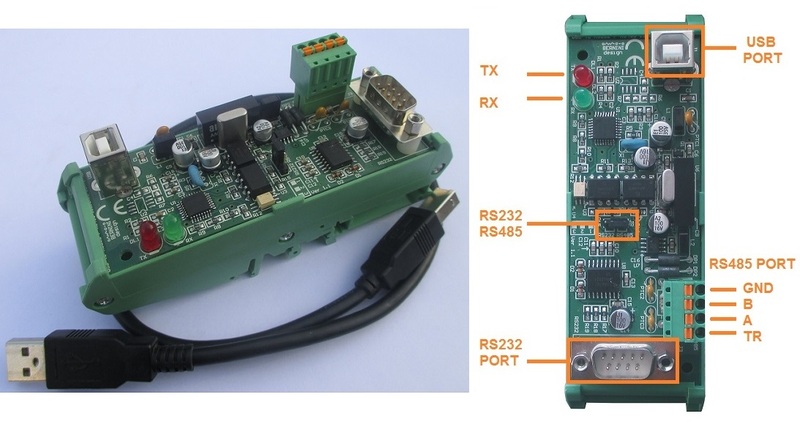 Connect the controller of the control panel (BE142, BeK3 or BE2KP)  to the MODBUS-USB converter  by using an RS485 twisted pair cable  (max. 1000m). Connect the converter  to a computer  by using an USB cable  (max 10m). Run the software of the controller on your computer. This small and compact module adapts the RS485 serial interface to a USB port. In this way the application that runs on the computer about generator control & monitoring is able to decode the MODBUS protocol. This module does not need a power supply. It is powered by the USB port. This module features an RS232 serial interface as well. By correctly configuring the jumper on the printed circuit board you can use this module as a RS232 to USB adapter. The jumper is in RS485 to USB by default (factory setting).